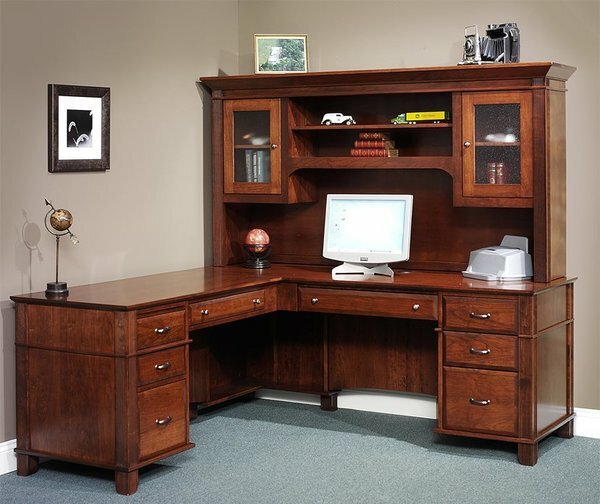 The Amish Arlington Executive L Desk with Optional Hutch Top is a divine mixture of function and refinement. This L shaped desk is perfect for a corner office or large office space. When the demands of your workday call for plenty of work space, the Arlington is sure to fit the bill. The Arlington features a left hand return which is a work space that sits to the left of the user. Equipped with a collection of file drawers, storage drawers and a pencil drawer, there's plenty of room for storage and organization. Handcrafted in Ohio, this Amish made desk is solid, stunning and strong. An investment in an Amish desk is one that pays off throughout the years as the beauty withstands the test of time, the function of the desk never wanes and the solid wood remains so strong that the desk does not have to be replaced. Our Amish desks are highly customizable pieces of solid wood furniture. Choose the wood and stain that works best for your home office or business. We are happy to mail samples for you to consider. Please email or call us with any questions about our custom made desks. We can be reached toll-free at 866-272-6773.